What is We Wear Perfume? We’re a Jasmine award nominated website and social media platform that aims to help you discover and buy fragrance. If you are struggling to find a fragrance or are overwhelmed by choice, we suggest you pull up a chair, get comfy and dip into the engaging stories around what fragrances stylish perfume enthusiasts and industry experts wear and why they love them. You can also check out our edit of the best fragrances around and how to wear them. We’re pretty sure you’ll find something that you’re going to want to try. Who are we? We’re fragrance editors immersed in the fascinating world of perfume. We have insider- access to what’s new, beautiful and relevant within fragrance, with a keen focus on niche, artisan and luxury makers. Although we’re based in the UK, we have an observant eye on what’s going on globally. We bring our considerable expertise from the world of fashion and media to create a relevant and exciting new voice in the world of perfume. Amanda Carr is an experienced trend forecaster, freelance journalist, brand consultant and co founder of the influential blog, The Women’s Room. As a perfume writer and retail expert, she is aware of just how complicated it is to find your perfect perfume and how overwhelming it can be to shop for a new one. 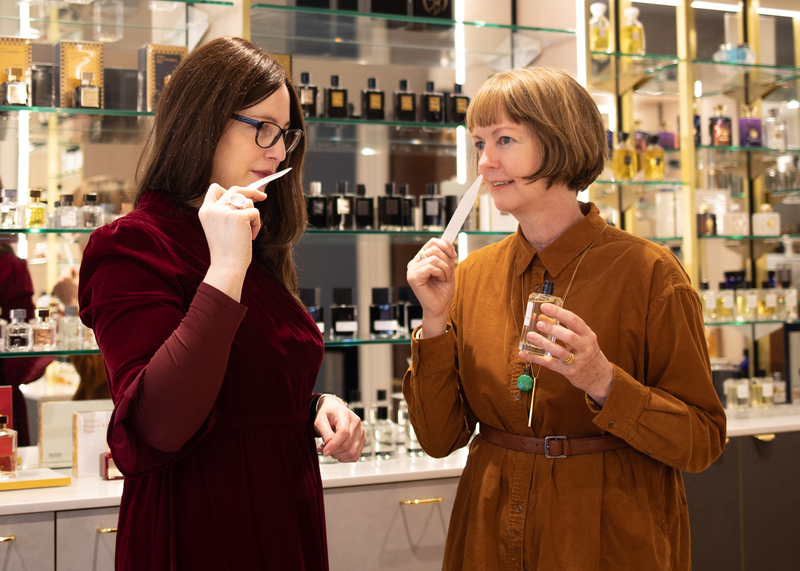 As fragrance editor for We Wear Perfume, her expertise on all aspects of perfume (and the fragrance industry) is extensive, and she will happily advise on how to select the perfect perfume for anyone, even those who say they don’t like fragrance. Tamara Fulton is an experienced fashion editor & stylist, consultant and creative director who has worked for some of the biggest luxury brands and creative independent designers in fashion and beauty. Her current role as Goods Editor for Hole & Corner magazine allows her to work with the most beautiful luxury product on the market, as well as some of the most talented photographers working today. As Fragrance Editor she brings a considered aesthetic as well as her unwavering love of fine fragrance to the process. Personal perfume shopping to discover your perfect fragrance. Future trends reports on UK and global fragrance trends and innovations. Brand strategy development for new and established brands. Content creation for social media and web editorial. Visual content styling for all aspects of visual brand presentation. Contact us here if you think we might be able to help. Please note: our reviews and stories are based on fragrance we have both bought ourselves and been given by brands and PRs. We do not accept advertising and aim to remain as independent as possible.